You can’t do a lot more than win seven out of eight but champion Kiwi jockey Opie Bosson is looking forward to finding out just how good Avantage is at Royal Randwick on Saturday. The Jamie Richards-trained filly created a big first impression winning at her Sydney debut last month and Bosson said there’s plenty of upside given how she presented. “She was quite fresh, she was bouncy in the birdcage and sweated up, and she sweated up again around at the barriers,” Bosson said. What’s also not like her is to lead but that’s where Bosson found himself in the Birthday Card (1200m) at Rosehill and he said it worked to his advantage on the day in beating the older mares. With what some would call a good experience first-up under her belt Bosson said Avantage is in a good place to take on a crack field of three-year-olds in the Group 2 $1m Arrowfield Sprint (1200m). “We just landed there, I didn’t really want to be there but we got quite easy sectionals early and she gave a good kick,”he said. “I didn’t have to get right into her, we knew she wasn’t 100 per cent fit going into it. “She doesn’t know how to lay down, she’s a tough filly. She’s not big but she’s muscly and compact. Avantage got away with a cheap first 600m of 37.89, compared to the 36.74 clocked by many of her main rivals in the Darby Munro over the same distance a race later. She’s $4.80 equal favourite with TAB with Classique Legend who was an unlucky beaten favourite in the Darby Munro. But Bosson has every right to believe Avantage has the scope to knock over the Arrowfield Sprint but he acknowledges his other two Randwick rides have their work cut out to different degrees. 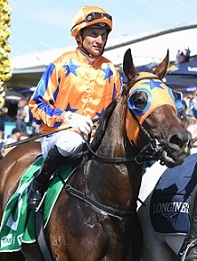 He partners Clementina ($34) in the Group 1 $1m Heineken 3 Australian Oaks (2400m) against boom filly Verry Elleegant then has a front row seat to the Winx finale on Danzdanzdance ($34) in the Group 1 $4m Longines Queen Elizabeth Stakes (2000m). “You’d be an idiot if you said you’re going to beat Winx but you’d think she will run a pretty fair race,” Bosson said of Danzdanzdance. That first run was a third behind Avilius and Queen Elizabeth second favourite He’s Eminent in the Group 1 Ranvet Stakes (2000m) on March 23. Verry Elleegant doesn’t have the aura of a Winx but Bosson says she’s still a formidable opponent in the Oaks. His mount Clementina had a tough run and was only beaten two lengths in the Adrian Knox (2000m) last week and Bosson is confident 2400m is no issue given her close fourth in the New Zealand Oaks.